Chaenomeles refers to the fruit of the Chinese flowering quince, called mugua (wood fruit); it should not be confused with the item sold in Oriental food markets as mugua, which is ordinary papaya. For Chinese herbal medicine, the dried, ripe fruits from Chaenomeles speciosa are selected (some other species may be substituted; see Appendix about quinces). This plant is in the Rose family that is the source of other fruits commonly used in Chinese medicine, including crataegus, mume, rose, and rubus. Like chaenomeles, these fruits have a markedly sour taste. 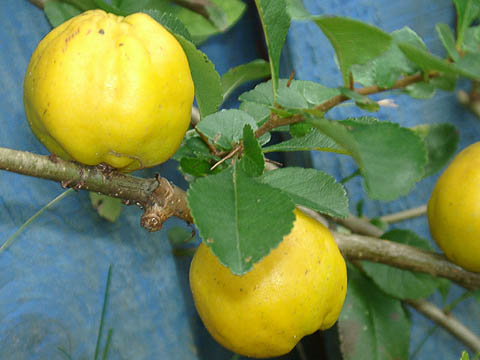 Chaenomeles is a close relative of apples and pears. Chaenomeles fruits are picked in late summer and autumn when they turn greenish-yellow; they are then blanched with boiling water, turning the skin grayish-white in color; then cut in half lengthwise and dried. The fresh fruits, which are harshly acidic and thus not edible raw, are used in making jams and jellies (sometimes with sweeter fruits, like apples). The plant is decorative, with showy flowers. Chaenomeles and other quinces have been grown for centuries for food, medicine, and so that people may enjoy their beauty. The Chinese herb was first described in the Mingyi Bielu by Tao Hongjing (ca. 500 A.D.). Its special reputation is that it relaxes the tendons, muscles, and meridians. This property was originally understood in relation to the ancient concept that the sour taste softens the liver (the liver belongs to the wood element, hence the name “wood fruit”) and thereby relaxes the tendons, which are considered under the control of the liver system. Chaenomeles is also considered a valuable therapy for moisture accumulation, so when stiffness is accompanied by swelling, this herb is often a significant ingredient in the formula to be prescribed. An additional beneficial property is that the fruits help alleviate indigestion. As is the case with most sour fruits, this one contains several organic acids such as malic, tartaric, fumaric, citric, and ascorbic acids. Active constituents responsible for treatment of pain and spasm are thought to include some saponins (glycosides), which are not yet well-defined. Initial pharmacology studies suggest an anti-inflammatory action for these components. Aside from dissipating cold qi from the liver, this category of medicinals also strengthens the liver and is used for insufficiency. Consequently, it supplements the yang of the liver. In prescribing supplementation of liver yang, these warming medicinals must be assisted by those for nourishing the blood because warming medicinals should not be used alone. Chaenomeles treats diseases of the sinews. It relaxes sinew tension and tightens slack sinews. In clinical practice, it is used for summer heat-damp damaging the center, engendering incessant vomiting and diarrhea that causes spasms of the gastrocnemius of both legs (this disorder is known a “cholera cramps”)…. [it is also used] for invasion of damp evil causing disharmony of the channels and network vessels, slack sinews, inhibited joints, swelling, distention, and deep pain (damp impediment)….White peony treats diseases of the sinews; it primarily emolliates the liver and relaxes tension to nourish the sinews. Chaenomeles also treats diseases of the sinews, but it chiefly disinhibits dampness and warms the liver to soothe the sinews. Chaenomeles disinhibits dampness and warms the spleen and stomach. It is used for exuberant dampness in the center burner….It is also commonly used for dampness evil streaming into the lower leg and upper surface of the foot resulting in damp leg qi. Chaenomeles is sour, warm, and aromatic. It primarily enters the spleen meridian. It can transform dampness in the middle burner, revive the spleen, and harmonize the stomach. It can be used for exterior damp-cold in the middle burner, and treating vomiting and diarrhea, cramping pain in the abdomen, and even cramp in the legs. It also enters the liver meridian and transforms dampness and relaxes the muscle and tendons. It can be used for damp painful obstruction syndrome, in which stiffness of the body, cramp in the limbs, swelling of the ankles, and difficulty in walking are present. It is an aromatic herb, but its tendency of action is descending; it is commonly used for dampness in the lower body. Chaenomeles and peony both are able to relieve cramping pain in the abdomen, cramp of the muscles and tendons of the limbs, and they can be used together. However, there are some differences in their actions. Chaenomeles relaxes the sinews by transforming dampness and invigorating the collaterals; it treats cramps and stiffness which are caused by dampness. Peony is sour and cold and enters the liver meridians. As sourness and cold generate yin, it is able to nourish the yin and blood of the tendons, therefore relaxing the muscles, tendons, and ultimately alleviating cramp. It treats cramp which is caused by yin deficiency. If cramp is caused by obstruction of dampness as well as yin deficiency, chaenomeles and peony should be used together. This formula is derived from Four Major Herbs Combination (Si Junzi Tang) with additional herbs for summer heat (pogostemon, dolichos), for dispersing central stagnation of fluid (magnolia bark, cardamom), and for resolving phlegm (apricot seed, pinellia). 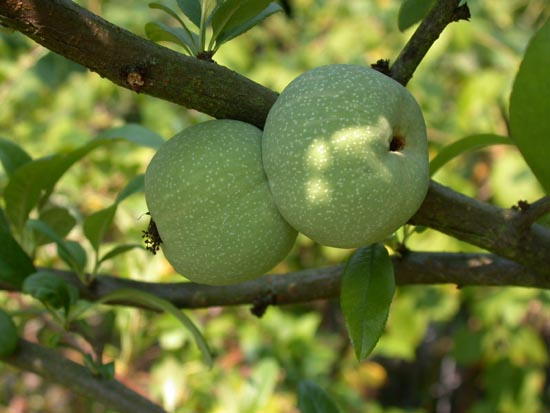 Chaenomeles is included to enhance the fluid resolving actions and to protect against the muscle cramping mentioned in the previous descriptions as a secondary effect of the stomach-spleen disorder. The formula is intended to separate the fluid phases, so that clear fluid can ascend to the heart, lungs, and head, while turbidity can descend (to be eliminated by urination). The herbs are used in doses of about 6 grams each in decoction. The herbs chaenomeles and eucommia are specifically selected for benefiting the tendons; eucommia has latex that stretches but is strong, like the condition of healthy tendons. The formula is also designed to disperse static blood (generated by injuries) and dispel wind (a pathological factor that yields inflammation, pain, and stiffness). The formula is indicated for all kinds of chronic and acute injuries to the tendons and for chronic injuries of the legs accompanied by pain. The herbs are combined in roughly equal amounts, ground to powder, and taken about 4.5 grams each time. Poor Hercules! After eight years and one month, after performing ten superhuman labors, he was still not off the hook. Eurystheus demanded two more labors from the hero, since he did not count the hydra or the Augean stables as properly done. Eurystheus commanded Hercules to bring him golden apples which belonged to Zeus, king of the gods. Hera had given these apples to Zeus as a wedding gift, so surely this task was impossible. Hera, who didn’t want to see Hercules succeed, would never permit him to steal one of her prize possessions, would she? These apples were kept in a garden at the northern edge of the world, and they were guarded not only by a hundred-headed dragon, named Ladon, but also by the Hesperides, nymphs who were daughters of Atlas, the titan who held the sky and the earth upon his shoulders. Hercules’ first problem was that he didn’t know where the garden was. He journeyed through Libya, Egypt, Arabia, and Asia, having adventures along the way. He was stopped by Kyknos, the son of the war god, Ares, who demanded that Hercules fight him. After the fight was broken up by a thunderbolt, Hercules continued on to Illyria, where he seized the sea-god Nereus, who knew the garden’s secret location. Nereus transformed himself into all kinds of shapes, trying to escape, but Hercules held tight and didn’t release Nereus until he got the information he needed. Continuing on his quest, Hercules was stopped by Antaeus, the son of the sea god, Poseidon, who also challenged Hercules to fight. Hercules defeated him in a wrestling match, lifting him off the ground and crushing him, because when Antaeus touched the earth he became stronger. After that, Hercules met up with Busiris, another of Poseidon’s sons, was captured, and was led to an altar to be a human sacrifice. But Hercules escaped, killing Busiris, and journeyed on. Hercules came to the rock on Mount Caucasus where Prometheus was chained. Prometheus, a trickster who made fun of the gods and stole the secret of fire from them, was sentenced by Zeus to a horrible fate. He was bound to the mountain, and every day a monstrous eagle came and ate his liver, pecking away at Prometheus’ tortured body. After the eagle flew off, Prometheus’ liver grew back, and the next day he had to endure the eagle’s painful visit all over again. This went on for 30 years, until Hercules showed up and killed the eagle. In gratitude, Prometheus told Hercules the secret to getting the apples. He would have to send Atlas after them, instead of going himself. Atlas hated holding up the sky and the earth so much that he would agree to the task of fetching the apples, in order to pass his burden over to Hercules. Everything happened as Prometheus had predicted, and Atlas went to get the apples while Hercules was stuck in Atlas’s place, with the weight of the world literally on his shoulders. The use of these “golden apples” (quince) as wedding gifts—as mentioned at the beginning of the story—was also a Greek custom: they were given to every Greek bride on her wedding day as a symbol of fertility and happiness. Due to its color, fragrance, and many seeds, the fruit was dedicated by the Greeks to Aphrodite (for the Romans: Venus), the goddess of love, and a symbol for beauty, love, fertility, and a happy marriage. The eating of quince at weddings is said to be preparative of sweet and delightful days between the married persons. The fruit has been prized ever since for its beautiful pink flowers and penetrating fragrance, described as “a blend of tropical fruit and apple/pear notes strong enough to freshen an entire room” (note: Yang Yifang mentioned the aromatic quality of chaenomeles; some of the Chinese varieties have little aroma, however). The fruit is also mentioned as a medicinal by the Greek physician Theophrastus (ca. 300 B.C. ).